Size: Fish is 7.1 inches long! 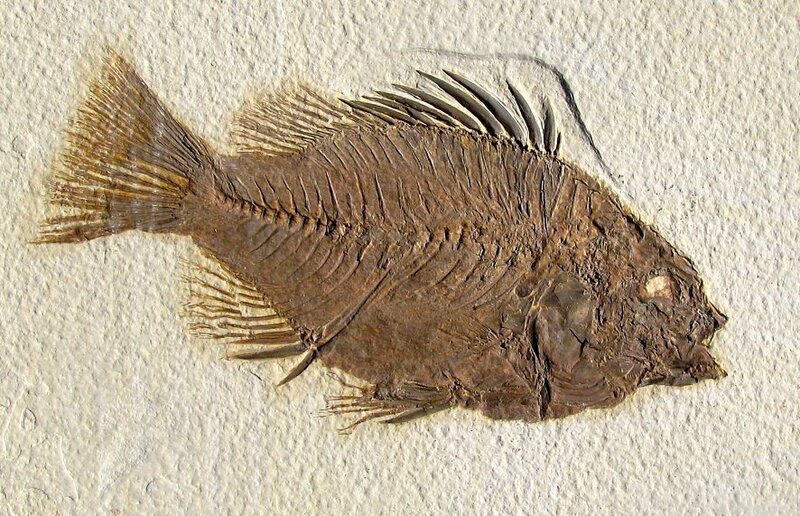 This is simply a fabulous fossil fish. It is a large Priscacara serrata from the Green River Formation of Wyoming. This classic type is very sought-after because of its recognizable look - similar to a modern-day Bluegill or Crappie. This fossil was extracted under a microscope to reveal the extremely fine detail. The textbook dorsal fin is beautifully displayed on this specimen. The other fins, backbone, tail, and other bones are very easily seen. The fish is beautifully centered on the squared plate of matrix - ready for framing! And, best of all, the fish is OVER SEVEN INCHES LONG - a substantial example of this type. This is an extremely displayable specimen of a very large Priscacara fish fossil.